the early 80's. If you own a 3500 sold by them chances are he has documentation of your car. 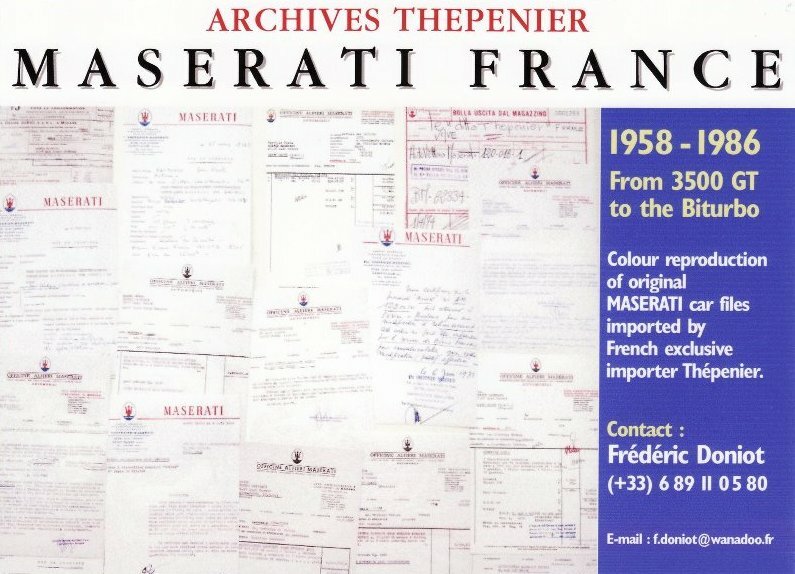 You can contact him at f.doniot@wanadoo.fr or visit his website Thepenier Maserati Register. To my opinion the best of all documents, "Caratteristiche dell'autotelaio". Here you find how your car has been configurated. It's full of little details. The weight of connection rods and pistons etc. Options and colors in the corner on the right. Provided by Bill Noon of Symbolic Motors. 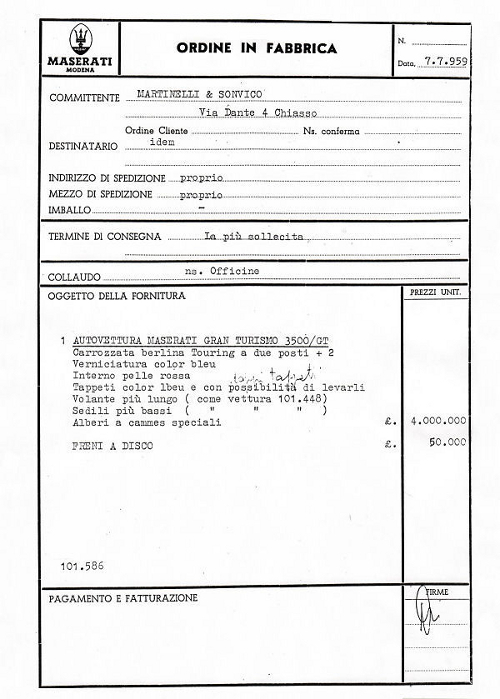 Document "Avviso spedizione", or the delivery note from 101-442. It contained the chassis and engine number of the car, the number and wheels and tyresize and type of brakes and color of the car. This toolkit only contained a steel hammer, so it can be assumed that 101-442 had the disk type Borrani wheels. Use streetview to get an impression of the first owners or the dealers area when the car was new. 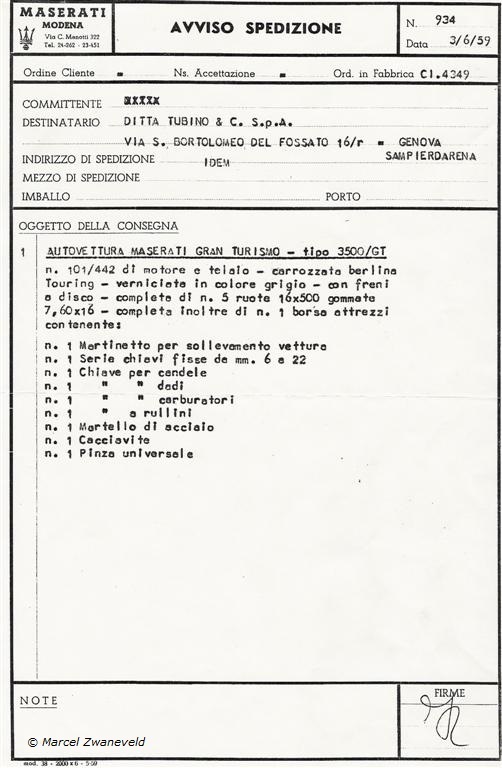 Document "Ordine in Fabbrica" from car 101-586. It seems to be equipped with special camshafts, lowered seats and a lenghtened steering column. The disk brakes where still an option. 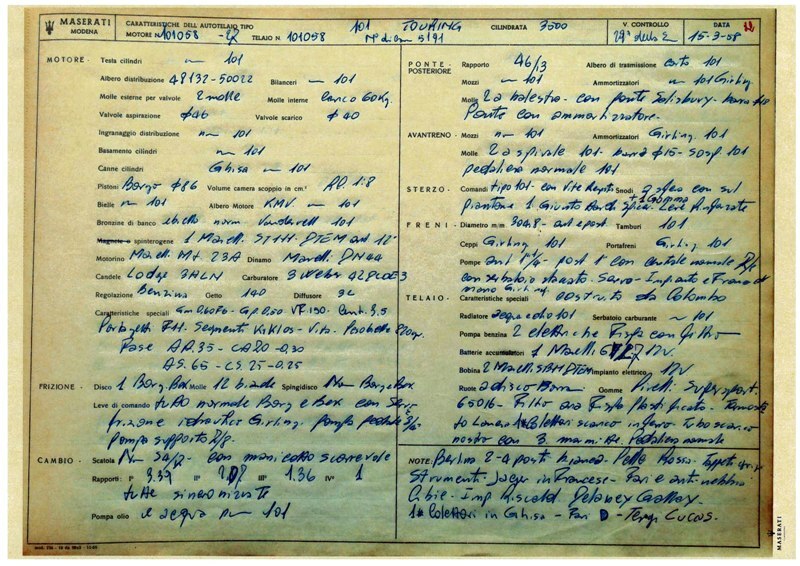 This document contains (the internal copy of) the invoice of 101-2574, february 19th 1963. Thanks to Andrea Montalenti for providing this document. This document contains the first factory check of 101-2574. 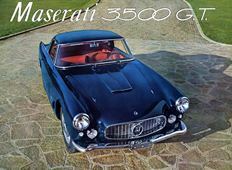 Note that the car has been sent back to the factory in Modena (600 km. from Napoli) for the first check just two months after the purchase.